We need to stop shaming breastfeeding images. If you find a breastfeeding photo offensive, you have some thinking to do. I’ve lost track of the number of times that I’ve been challenged for sharing breastfeeding pictures online, or the number of occasions that I’ve read about mums who have been shamed for feeding their children at their breast. It’s 2016 and stories of mums being shamed for breastfeeding hit headlines regularly — it appears that our children’s nutrition is newsworthy… albeit not in the healthy and informative way we may wish for. A while ago, I started the #ISupportBreastfeeding project in an effort to turn the social stigma of breastfeeding on its head. The project focused on support without caveats… on acceptance without shame…and it captured the hearts of thousands of nursing mums. Together, our voices of unwavering support were heard. Yet with a few too many instances of front-page breastfeeding scandals to recount, the time inevitably came to launch a new project: the #NoShame project. This campaign serves as a reminder of the importance of support and the necessity of factual information. I chose support above shame. I chose information above ignorance. I chose my baby’s needs above your opinion. Do we really need such a project? A message sent to Mama Bean. Image supplied. It amazes me that a picture of a baby breastfeeding could be considered inappropriate and in all honesty, it horrifies me that people are sexualising infant nutrition… how has the divide between our cultural norm and our biological norm grown this large? I’ve asked before and will ask again, what is so offensive about a mother feeding her child? What exactly is so offensive about the breast? Because truly, there is no shame in breastfeeding. If you would like to show your support for the #NoShame project, you can post (or message) your favourite nursing picture to the Mama Bean Facebook page, using the #NoShame hashtag. 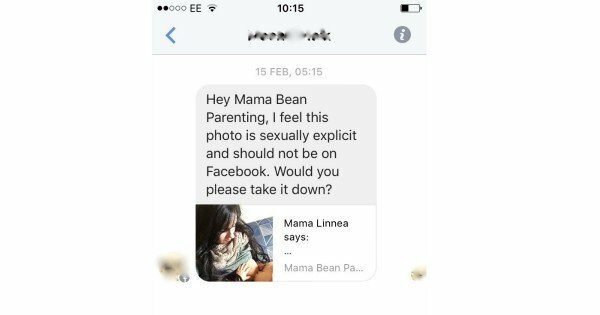 This post originally appeared on Huffington Post and Mama Bean Parenting and was republished here with full permission. Follow Mama Bean on Twitter.